Seattle First Limo Service | (206) 458-8111 | Airport Town Car, Business Travel, SeaTac Transportation, City Tours. Use our secure online reservation form to book your trip. Book your next round-trip online and receive $10 off your order. Fill out a short form and get a quick, emailed response. For immediate assistance, please call (206) 458-8111. Seattle First Limo Service have been proudly providing transportation services in the greater Seattle since 2002. Our goal is to provide you with reliable, alternative, luxurious service. We offer elegant, well maintained vehicles that cater to all of your needs, from a limousine service for a special occasion to an executive Town Car waiting for you at the airport after a long, tiring flight. Seattle First Limo Service is renowned for its reliability, safety, comfort and great prices. Our professional drivers are always on time and very knowledgeable of the greater Seattle. We recognize that your time is important and you deserve the utmost quality in professional ground transportation. For premium quality transportation at remarkably reasonable rates, look no further than Seattle First Limo Service! Available 24/7 by Reservation. 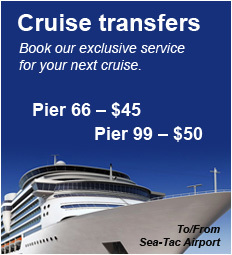 Call us: Seattle at (206) 458-8111; Eastside at (425) 440-2314. Seattle. Seattle First Limo Service also provides transportation of individuals and groups for corporate meetings, conventions, trade shows, and entertainment in Seattle and the surrounding areas. Day or night on the town, Concerts, Casinos, Sporting Events, Birthday parties, Cruise ship terminal service, Christmas light tours.